We were in need of a little adventure over the MLK long weekend and Mr. C&G was in need of a late afternoon business meeting in Boston on Friday. With Boston just 2 hours away I was more than happy to pull the boys out of school a few hours early and hop in the car with an overnight bag packed for the 4 of us. The last few times we've stayed overnight in Boston (we've done several day trips recently), we've been branching out into other neighborhoods. Brookline is a wonderful new find for us, and Cambridge is always a favorite. 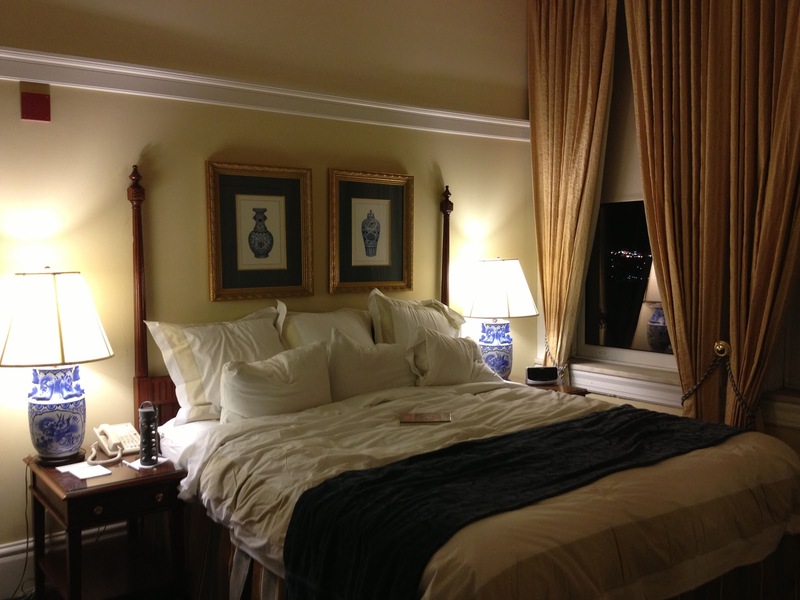 This time we stayed right in tourist central, at the Marriott Custom House next to Faneuil Hall. With it being the dead of January things were pretty empty so I was looking forward to not fighting the usual crowds around Quincy Market or dodging the street performers and souvenir carts. Marriott Custom House is best known as one of their time share vacation clubs, but we just discovered they were available as hotel rooms as well. The rooms are 1 bedroom, 1 bathroom, living room & small kitchen (fridge, microwave, sink), and while I wouldn't really want to stay for an entire week, it was perfect for our short adventure. For the price ($165/night) and location, it was absolutely perfect! The boys loved having all the room to spread out and play, and there's a game room and outdoor observation deck on the top floors. The pull out sofa wasn't the most comfortable for big C&G, but little C&G loved his rollaway and said he slept "super good". While Mr. C&G had his meeting in the hotels cavernous "counting room", we ventured out into the bitter cold to explore. First order of business was the nearby Gap Kids to buy the boys fleece hats. Travel planner that I am completely ignored the forecast, although I think I was too focused on looking forward to temps in the upper 40's for Saturday . 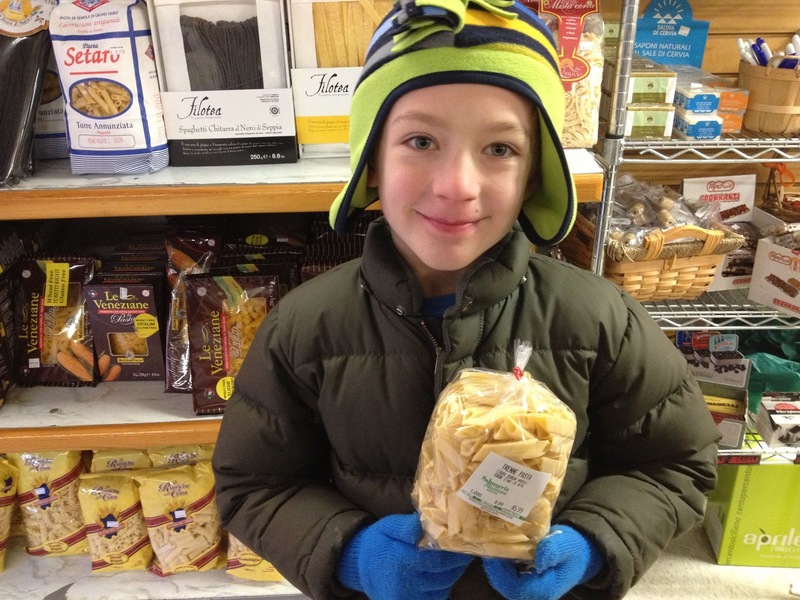 . .
We were headed to the North End (a short, but cold & blustery 10 minute walk away) for some Italian treats. To get a quick break from the cold we stepped inside the Salumeria Italiana, a wonderful little grocery filled with all things Italian. Pasta in every shape imaginable, cheeses and salamis hanging from the ceiling, fun cookies and cakes, all of which made us desperately miss our recent trip to Italy. Little C&G was so excited to find his absolute favorite (and of course impossible to find, even in Italy) kind of pasta called "trenne". Triangular penne. . . So 3 bags and one happy boy later we headed back out to find Mike's Pastry for some espresso (for me) and cannolis (also maybe for me). There were several gelato places on our walk that on any other day we would have been happy to sample (it is the C&G rule of travel after all), but on this day we all agreed it was much too cold for gelato. Mike's came highly recommended by a very good friend, and although we were warned about the long lines it was pretty empty for an early Friday afternoon. Little C&G got very upset, because he took one look at all the treats at the counter and immediately the tears came along with "How am I going to choose". I hear ya buddy. Of course Big C&G just assumed he could get one of everything. We narrowed it down to a few things to share, and I told the boys to grab one of the little cafe tables as soon as some people got up. I didn't know (so I'm telling you all so you'll know) that the tables offer waitress service. Brilliant, no waiting in lines! So we grabbed a table, and our waitress brought over a much needed espresso, one chocolate covered cannoli, one pistachio cannoli, several macaroons, biscotti, pignoli cookies, and a cupcake. After our sugar fest (yes, we ate it all! ), we got back in line to get some stuff to go for Mr. C&G to share during his meeting. 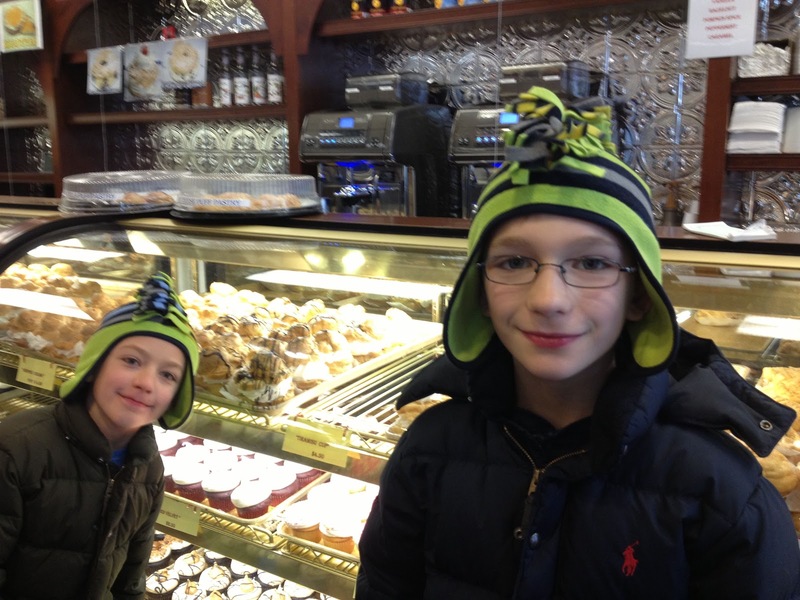 The boys were wowed by the string coming from the ceiling that they used to tie off the pastry boxes and I'm sure they would have spent the rest of the day there, but we headed back out into the cold. We followed the red line on the sidewalk (The Freedom Trail) and it took us right past the Paul Revere house. A little history to go with our sugar. . . There was no line to get in and we were happy to get out of the cold for a bit so we decided to check it out. Cash only ($3.50 adults, $1.00 for the kids) and it's self guided. There was a nice gentleman guide downstairs who was happy to tell us all about the rooms and life back then. There was a "kitchen", living room, and fireplace big enough for them to stand in. Upstairs there were 2 bedrooms and a guide who was absolutely silent. 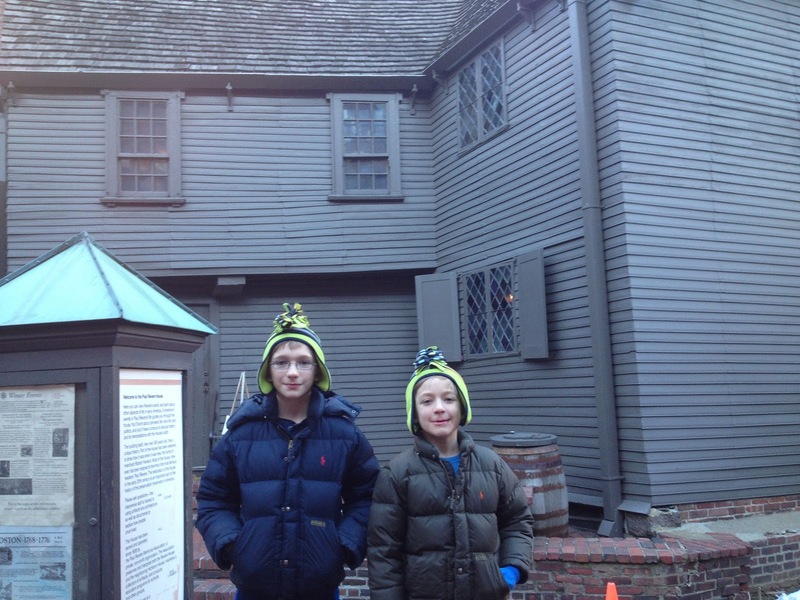 If I'd known ahead of time we were going to stop by I would done a little Revolutionary War research, but I think the boys were just happy to be out of the cold for a bit. They did have fun trying to imagine living there with with lots of brothers and sisters, and they were amazed that kids back then didn't get their own rooms. . .
We took a detour through Quincy Market to get out of the wind on our walk back to the hotel. Quincy Market is a giant food hall with lots of vendors where you can get a quick & cheap meal. Pizza, bagels, smoothies, fried rice. You name it, most likely it's here. There are tables in the center of the market and if it's nice out plenty of space outside to sit. It's usually pretty crowded with tourists and nearby office workers, but we found it pretty empty in the late afternoon. And thankfully we weren't hungry! Back at the hotel we checked out the game room, which had foosball, pool, checkers, and some video games. Not enough to keep the boys occupied for more than 10 minutes, but it was fun to explore. The observation deck is all outside on the top floor and with the crazy winds and cold temps we couldn't be tempted out the doors. We had some time to kill before our dinner reservation so we headed back to our very spacious room and the boys spread out with their legos, I grabbed my book, and everyone was happy. Dinner was at the slightly fancy steakhouse Del Frisco's on the waterfront. The boys know if we make them put on their collared shirts that we're going someplace nice and they have to behave accordingly. It's a pretty loud place and we were lucky to have one of the banquettes, so nobody would notice a couple of noisy boys in the midst of a lego minifigure battle. But we did insist they keep it down and there are no toys on the table after the food starts arriving (our usual C&G rules). Plenty of bread and butter kept them happy while the grownups had cocktails. 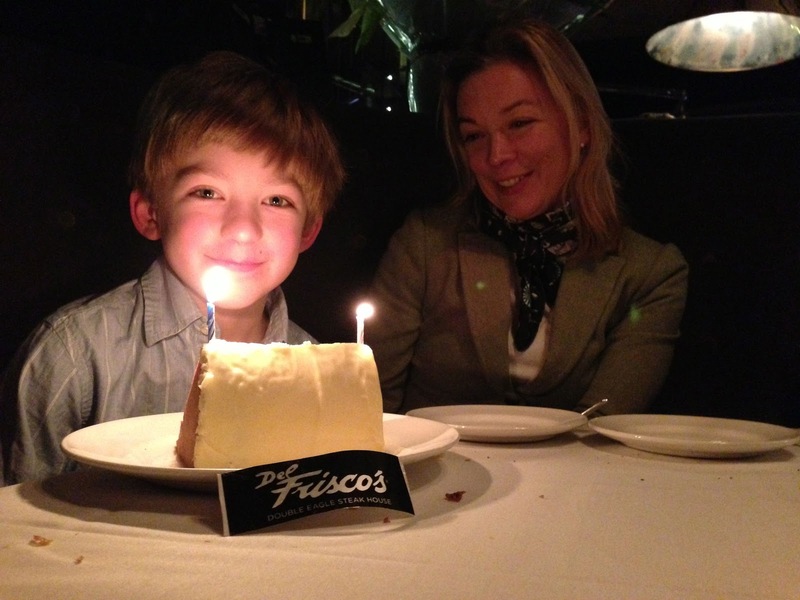 Del Frisco's doesn't have a kids menu but they are very accommodating. There are burgers on the menu, and I'm sure they could do a grilled cheese on a burger bun, or they're happy to make up a bowl of linguini with butter and cheese. The sides are also great to share with the kids and the onion rings come big enough to put on your wrist (a big hit). We split the giant lemon cake for dessert (be warned, it's huge!) and then headed back out into the cold. Del Frisco's is accessible on the silver T line, or it would have been a short cab ride back to our hotel. We had our car because we had a guest with us and both the hotel and the restaurant have valet parking. Part of my original plan was to take the boys to the Institute of Contemporary Art (ICA), just a short walk away from Del Frisco's and also on the waterfront, before meeting Mr. C&G and his client at dinner. I think if the weather had been nicer I would have made it happen. The ICA looks like it would be a lot of fun for the boys (modern art always seems to make them laugh) but since everyone was happy enough hanging out in the hotel I'll have to save it for another trip.